ELVIS JACOB STAHR, JR., was born in Hickman, Kentucky, on 9 March 1916; was graduated from the University of Kentucky, 1936, and was Cadet Colonel of its ROTC regiment; studied law on a Rhodes Scholarship at Oxford University, England, 1936�1939, and received three degrees; became an associate in the New York law firm of Mudge, Stern, Williams & Tucker, 1939; was called to active duty as a second lieutenant, Infantry, October 1941, and served as weapons instructor at the Infantry School, Fort Benning, Georgia, 1942�1943; was an officer student at Yale University, 1943, and received a diploma in Chinese language; served in North Africa, 1943, and in the Chinese Combat Command, China-Burma-India Theater, 1944�1945; was awarded the Bronze Star Medal with Oak Leaf Cluster (U.S.) and three Republic of China decorations; left service as a lieutenant colonel, December 1945; returned to his law firm and married Dorothy Berkfield, 1946; was professor of law and dean of the College of Law at the University of Kentucky, 1948�1956; was Special Assistant to the Secretary of the Army for Reserve Forces, 1951�1953; was vice chancellor of the University of Pittsburgh, 1957�1958; was president of West Virginia University, 1958�1961; served as Secretary of the Army, 24 January 1961�30 June 1962; under his direction a major Army reorganization plan was launched, the combat division structure reorganized, special warfare forces expanded, the community relations (civic action) role enlarged, and the Army strengthened during the Berlin crisis; was president of Indiana University, 1962�1968; was president of the National Audubon Society, 1968�1979, and senior counselor, 1979�1981; since 1982 has been the Washington partner of the San Francisco law firm of Chickering & Gregory, P.C. ; has been a member of the U.S. delegation to four international conferences; has served on four Presidential Commissions; was president of the Association of the United States Army, 1965�1968, and chairman, 1969�1974; was national chairman of the USO, 1973�1976; holds twenty-seven honorary doctoral degrees. New York entrepreneur Leo Fox supplied portraits of Secretaries Brucker and Ailes as well as that of Secretary Stahr under the Charles J. Fox pseudonym. 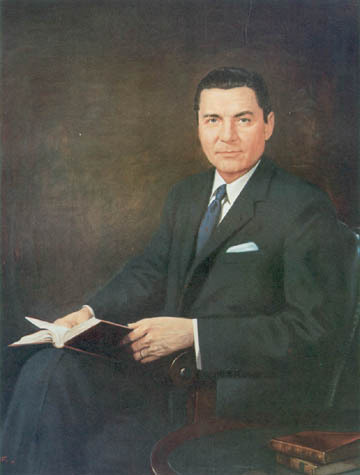 Others of his commissions included President John F. Kennedy, Vice President Alben W. Barkley, Federal Bureau of Investigation Director J. Edgar Hoover, and Selective Service Director Lewis B. Hershey. Fox retained the services of Irving Resnikoff to paint portraits for which he was the contracting agent.